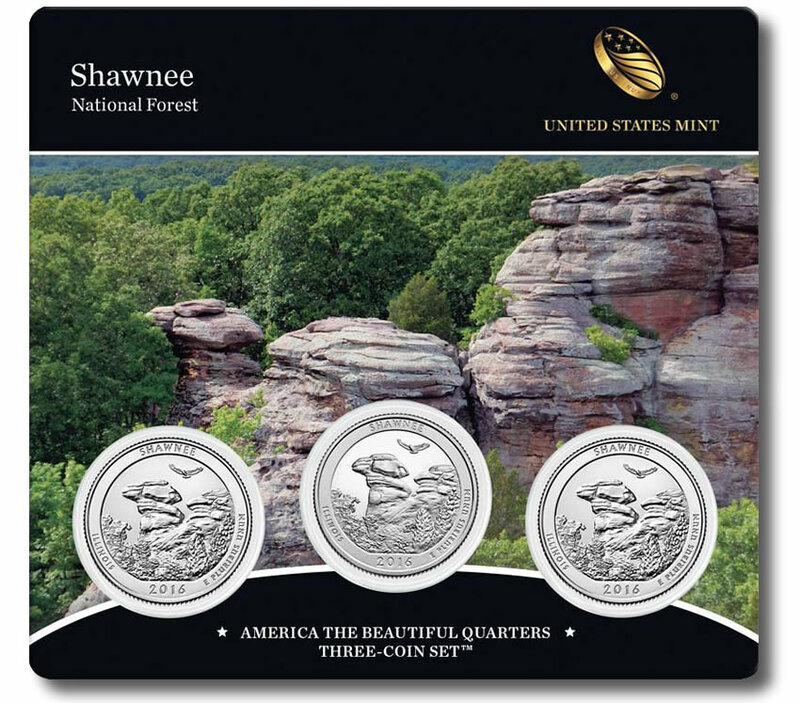 Today, Feb. 22, the United States Mint started selling three-coin sets of Shawnee quarters. Coins of the set commemorate the national forest in Illinois, and feature a reverse design emblematic of it. This latest America the Beautiful Quarters Three-Coin Set is the first release for this year and the 31st overall in the series. One uncirculated coin from the U.S. Mint facility in Denver with a ‘D’ mint mark. One uncirculated coin from the U.S. Mint facility in Philadelphia with a ‘P’ mint mark. One proof coin from the U.S. Mint facility in San Francisco with a ‘S’ mint mark. The mint marks appear on the right side of George Washington’s portrait and under the inscription, IN GOD WE TRUST. 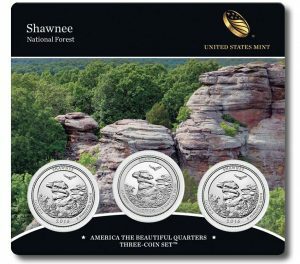 All three coins are presented on a durable plastic card that has a picturesque photo of Illinois’s Shawnee National Forest. The back of the card offers information about the forest, the three quarters and their designs, and a U.S. Mint Certificate of Authenticity. Pricing is $9.95, which is the same as the prior 25 sets and $5 less than the first 5 from 2010. Most of the older sets remain available. Figures show their sales range from 12,257 to 24,042. Order products with America the Beautiful Quarters on the Mint’s website, right here, or call 1-800-USA-MINT (872-6468). Upcoming 2016-dated sets will feature quarters honoring Cumberland Gap National Historical Park in Kentucky, Harpers Ferry National Historical Park in West Virginia, Theodore Roosevelt National Park in North Dakota and Fort Moultrie in South Carolina.